Last night Casey was away ~ back to Maryland for some business. Though I tried to go to bed early, I got way too into my scandalous book and stayed up until I was closer to midnight than I needed to be. Kenny woke up at 3:00 AM, instead of 1:15. (There goes my theory about something specifically happening at 1:15 to wake him up.) This time, I let him cry himself back to sleep. That lasted until 3:30. I was still not ready to give in, so I let him cry until 3:55, and when the sobs turned to screams, I went in. I opened the door and he was instantly silent. I walked over to him, and he held out his arms. “Chair,” he said quietly. I curled his little body against me and we sat in the chair for about a half and hour. But he was wide awake. You could tell that he knew he was supposed to be sleeping, but he just couldn’t. I was afraid that I’d fall asleep in the chair and he would be off roaming through the house until dawn, so I climbed into the guest bed that’s in his room and we snuggled in together. Except that he thought that was the coolest thing ever, and kept popping up, saying, “Mama! Big Bed!” I finally got him settled down (as the clock hit 4:30), when Dudley seemed to notice that I was no longer in my bed, and he must have been worried, because he came looking for me. 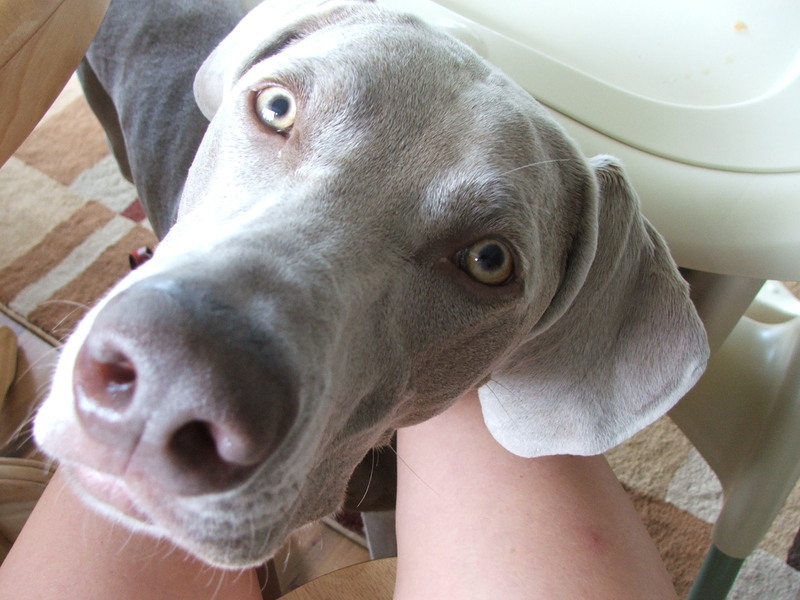 His trusty weimaraner nose got him to Kenny’s room, where he leaped onto the bed in relief and gratitude that I had not deserted him at this darkest hour. Kenny though that Dudley flying into the bed was even cooler than cool, and that got him jazzed up all over again. Another fifteen minutes went by before all of us fell asleep: Kenny curled up against my stomach with his head on my shoulder, Dudley curled into the crook of my bended knees, and me, terribly uncomfortable, but unwilling to chance waking either of them up again. Ah, but the restless sleep wasn’t meant to last… Kenny popped up at 6:30 and dove on top of my head. “MAMA!” Then, spying Dudley, he dove on top of a very surprised Dudley. “DUDLEEEEEE!” As he slid off the bed and headed to his legos, I considered the possibility of letting myself fall asleep again, but realized that doing so would give both Dudley and Kenny run of the house. And let’s face it, it’s not like I’d wake up to the surprise of a breakfast in bed and the smell of frying bacon and eggs; more likely, I’d wake up to Kenny climbing onto the stove, and stirfrying his diaper. I stumbled upon your blog 6 months ago and I must say it cracks me up! I have two little boys who are 3 and 4 years old, not quiet 13 months apart so I can relate to many of your tales. This one reminded me of a brief period when my boys were 1 1/2 and 2 1/2 both of them would get up at 2:30am to play. After many sleepless night I broke down one afternoon, locked all of us in their bedroom to take a nap. While this was a very well thought out plan in my head in reality not so much! I spend 4 hours re-folding clothes, picking up toys, cleaning desitin off of windows and vacuuming up an entire bottle of baby powder that to this day I have no idea how they got out of the closet.